Today, the entire nation is “celebrating” the tenth anniversary of the terrorist attacks. Once again the nation will come together in prayer. Pray to God, the real god. The god that, oops, forgot to lift a finger to help save any of the thousands of innocent lives that were lost; the god that failed to do anything to prevent the billions of dollars of damage that was done. Yes, that god. The god that the late comedian George Carlin called, “Incompetent at best.” As I continually remind all of those that I know, it was religion that caused the destruction of the twin towers. It was religion that took the lives of many innocent people that day. It was a complete and unwavering dogmatic belief in a flawed worldview based upon misinterpretation of poorly written millennia-old nonsense that caused the events of 9/11. It was the exact same belief that caused millions to perish in crusades and inquisitions. It is the same belief that today takes the lives of children denied proper medical care or cause them harm by torturing them for being born in the first place. Islam, like Christianity, is guilty of causing death and destruction. It’s easy to say, and many do, that it was Allah, not Jesus, that was responsible for 9/11. Yes, the terrorists were followers of Allah. The terrorists were adherents of Islam, and in their mind, they were carrying out their god’s will. But today, millions of Americans will pray to Jesus (and some to Allah, Yahweh, Vishnu, whoever) for thanks. Hello? Any of you lemmings ever consider what you’re doing? Thanks for what? For messing up and allowing people to get killed? If God was in the work-place, he would have been fired! Do not pray to an ineffectual, sadistic monster. Rather, how about we have a moment of silence to reflect upon how we lead our lives. Rather than pray to non-existent deities, why don’t we all make a pack with each other to treat each other with love and respect. Instead of praying to God to help prevent disasters (already proven that it doesn’t work), let’s look to ourselves. Let’s begin a new chapter in human social development and hold people accountable for their actions and look to the one proven entity that has the power to make the world a better place to live – us. Ten years have come and gone since the tragic events of 9/11 and most people still miss the point. 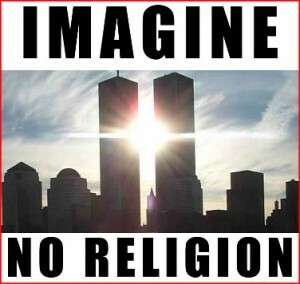 If religion had no stronghold, the twin towers would still be here. Only religion could motivate someone to commit such atrocities. And only religion can cause the current wave of hatred that spreads through our country like wildfires, accosting those who have divergent views from the masses. The world has many problems. But prayer is not the answer. Prayer is the problem. Only we have the power effect changes. Forget the praying and do something constructive and positive. Remember 9/11 for what it really is. A blatantly powerful example of what religion is capable of.